Some time ago I tried out some budget proof sheet mask from the store action. These were so good. But believe it or not, but now the action even has cheaper sheet masks! Yes, you read this correctly. So of course I needed to try these two masks. Because on the packing they just looked so cool, like a cat and panda. 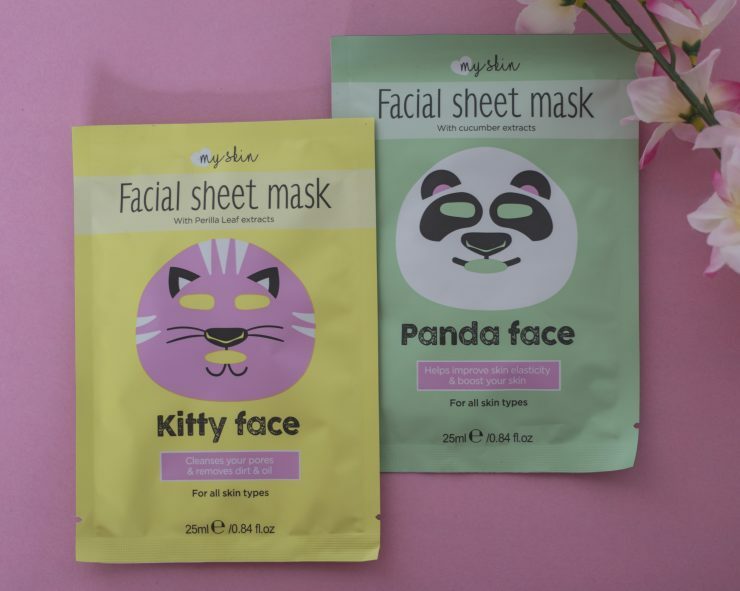 Are you curious or these cheaper sheet masks work the same or maybe these are even better? This is a sheet mask with cucumber extracts. It must give the skin a boots and helps to improve the skin elasticity. It a good drenched mask that stay good on his place. When you bring this on the skin it directly gives your skin a refreshing feeling. It smells fresh, I smell namely the cucumber but it also smells a bit like a bamboo. The mask really looks so funny, it just looks like on the packing. It’s a very good mask that makes my skin so soft! This is a mask with perilla leaf extracts, it much clean your pores and removes dirt & oil. Just as the panda masks looks the kitty mask the same as on the packing. It also fits perfect. But this mask smells a bit weird. Far away I smell a bit a clay scents but for the rest is it a bit a weird smell… The mask feels good on my skin, but I don’t have the feeling that it cleanses my skin. After 15 min my skin looked good and felt soft, but that is it. Not a clean your pores working, but all with all is it a good mask! From these two face masks is the panda one my favorite. They both work almost the same. Only the panda masks has as extra the fresh feeling and a good smell. But for the price they have you can try them both just for the fun. Because their both are funny and they do something for the skin! These face masks are available at the action and the price for one face mask is €0,59. These masks look so cool and easy use. And price is amazing! Yes, the price is indeed amazing!